Alongwith the Supreme 20 electret condenser cartridge, the 1 was the original SUPREME ! 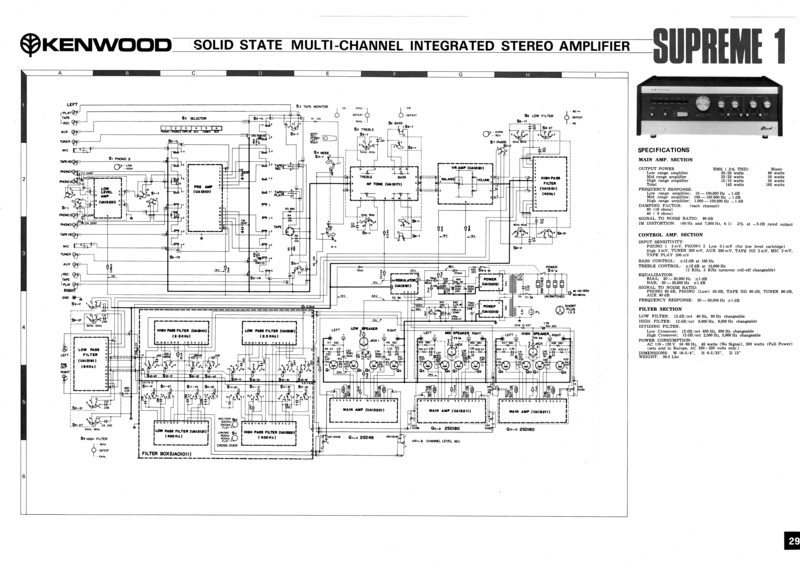 Epoch-making as this was Kenwood's first transistorized (high-end) component. Epoch-making also because its planned successor would indirectly lead to the formation of Kensonic Labs, also known as... Accuphase. The Supreme 1 is an integrated amplifier with a twist : it is a three-way integrated amplifier. Said differently, it holds a frequency divider for each channel and three speaker outputs : low, medium and high. The crossover frequencies are selectable, can be bypassed for "normal" use or even used in part for a two-way system. Surprising, isn't it ? The back panel, shown below, holds the three speaker outputs (#1 & 2 : low/mid/high), the crossover selectors (low/mid, mid/high, flat : #3), the stereo preamplifier output (#4), low-level inputs (#5), high-level inputs (#10) and RCA/DIN tape outputs (#8 & 9). The Supreme 1 was built even better than the earlier and contemporary Sonys : plug-in boards which are fastened just like any RAM board in a computer ! The solid steel chromed chassis supports comfortably sized caps and a huge transformer. And if Kenwood's staple dual-transformer layout was for later years, the 1 still offered a semi-parametric bass control and a normal/reverse phase selector ! Costing the astronomical sum of 184,300¥ in 1967 (a TA-1120 cost a mere 88,000¥ two years before), the Supreme 1 represented absolute ultra-high-end audio reproduction : it was Supreme. After a long hiatus, Trio/Kenwood unveiled in 1973 the successors of the Supreme, the Model 500 and Model 600. The Supreme badge vanished along the way and even the tag that was planned to be carved on the front plates finally was deemed too... something. 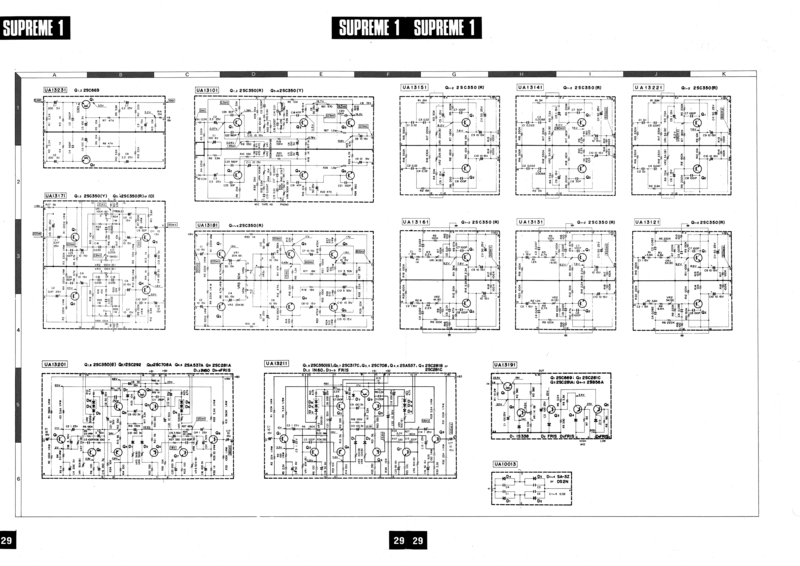 See the large two-page schematic of the Supreme 1 here and here and the cover of an october 1966 japanese magazine here. ...apparently with Sony output transistors !